New Sounds, Textures and Repertoire. Instructional/Guitar/DVD. DVD. With guitar tablature. Homespun #DVDJUBDG21. Published by Homespun (HL.641722). 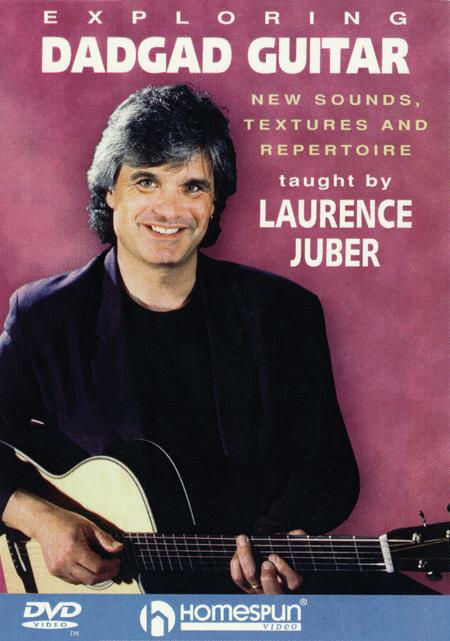 Fingerstyle guitar virtuoso Laurence Juber unravels the mystery of this beautiful and versatile guitar tuning, long used by Celtic guitar stylists. Laurence has mastered its intricacies, and he teaches the evocative tunes he has composed, and which appear on his latest CD for Narada Records. He shows how this tuning can be used to beautiful effect in different keys, and how an arrangement of a familiar tune such as “Danny Boy” can be developed in a variety of ways. This is a video that will open vast new possibilities for guitarists who want to extend their musical vocabularies. 90-MIN. DVD • INCLUDES TAB • INTERMEDIATE LEVEL.